Which is the best posh burger chain in London? Following my less-than-glowing review of Meatliqour, which generated a fair amount of debate on Twitter, I was asked by @londoneating which was my favourite London burger. The answer to that is simple – Hawksmoor. The succulence and depth of flavour found in their burgers is simply superb, the perfectly toasted buns usually do a good job of holding everything together while the quirkier options at the Seven Dials branch (the kimchee burger and the rotating third burger of the month) are usually very good in their own right. They even come with chips, including my favourite triple cooked chips. Although I think it’s great value at £15 (excluding drinks and service obviously), not everyone is willing to spend quite that much on a burger and even if they are, getting a table at Hawksmoor on a whim, especially the Seven Dials branch, can be tricky. I therefore decided to undertake a whistlestop survey of the more interesting (i.e. not McDonald’s or Burger King) burger chains in London. 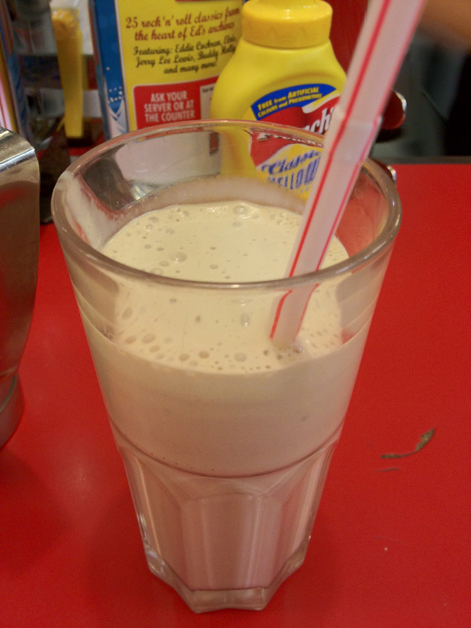 In general, I tried to order the same meal at each – a plain burger, onion rings and a milkshake. I opted for a plain burger on the assumption that if the restaurant in question can’t get the core staple of a straight beef burger right, then they have little chance of getting anything else right. If asked how well-done I’d like it, I ask for and take the recommendation; otherwise I go for medium. As for the onion rings and milkshake, well I just really like onion rings and milkshakes. 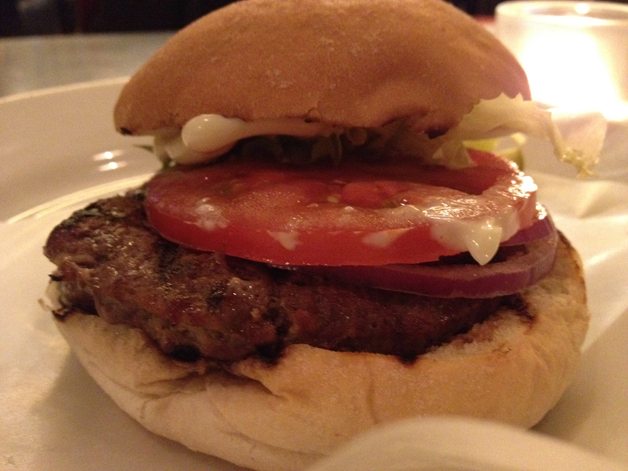 Given the ubiquity of the burger, I stuck to chains that concentrate on just burgers. I plan on comparing a selection of independent burger joints once my gut recovers from the meat pounding it’s been taking – got any suggestions? Have I missed out on your favourite London burger chain? Let me know in the Comments or drop me a line. Byron has long been one of my favourite places to get a burger, but I was concerned by reports from The Euro Hedgie that standards had slipped at the ever expanding chain. Thankfully a visit to the Soho Intrepid Fox branch showed that these concerns are unfounded, at least for now. 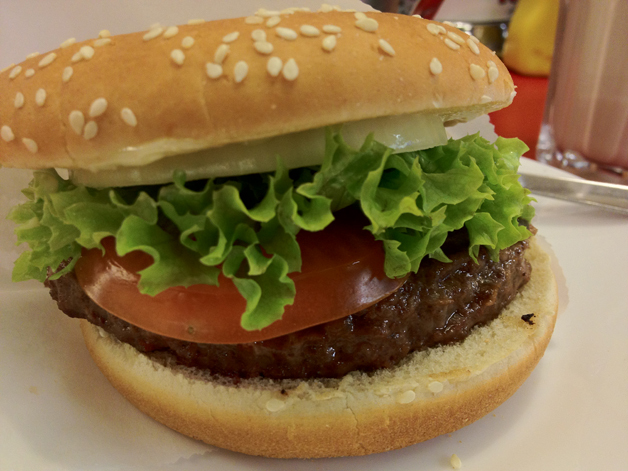 The six ounce Classic hamburger cooked medium/medium rare-ish is just as succulent and meaty as ever – the moderately coarse patty doesn’t have too much fat though and has a clean after taste. The limp vegetables are nothing to write home about, but the toasted bun holds everything together beautifully with little to no spillage. 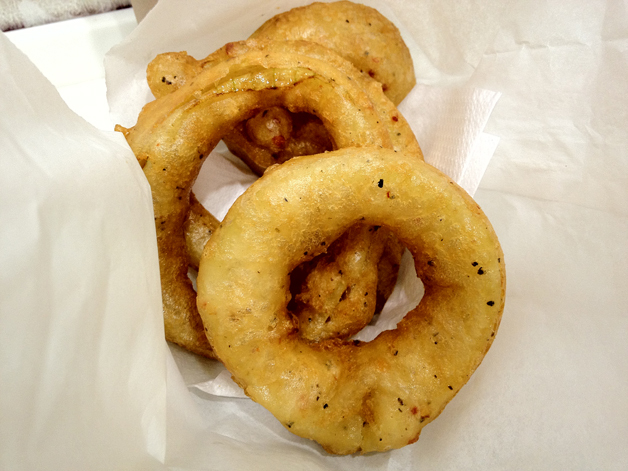 The onion rings are just as good. The batter was a bit stodgier and oilier than I remember it from previous meals and the peppery flavour is less pronounced, but the batter is still thin and light, especially when compared to other onion ring batters I’ve had. The batter gives way to a firm, sweated slice of onion that’s moist, not too soft and actually tastes of onion. Byron’s thick milkshakes are like desserts in a cup and the chocolate flavoured version has a fairly dark taste to it that’s not too sweet. Not bad, but the viscosity won’t be to everyone’s taste. 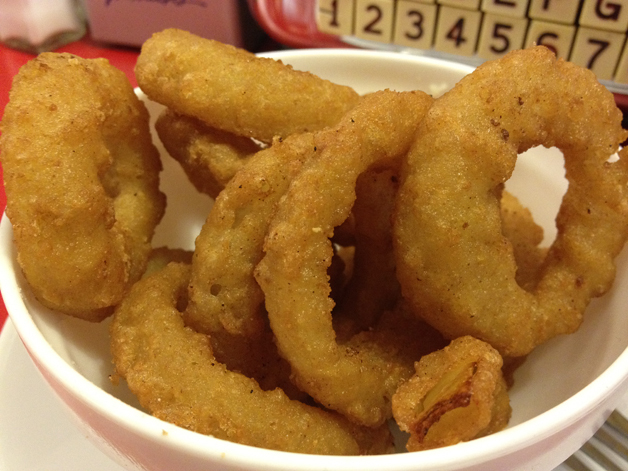 The onion rings may be wobbling slightly, but the service is just as good ever. When faced with a full house on a weekday evening, I resigned myself to ordering my burger as a takeaway and retreating to one of my nearby safe houses, but the hawkeyed front of house staff immediately offered me a table when one became available, even after I had already placed my take out order. It’s sad when good service like this is the exception rather than the rule. Cost for one person: £14 approx. I stretched my definition of restaurants that ‘concentrates on just burgers’ to include the originally named The Diner. Why? Any American-style diner that serves both burgers and flat white coffees immediately gets my attention. I didn’t get a chance to try The Diner’s flat white on my dinner visit though and the rest of the fairly extensive menu also includes burritos and all-day breakfasts. Don’t be tempted to sit at the back of the dim, moodily lit dining room as I did – that’s a recipe for being ignored despite the multitude of waiting staff. Sadly, The Diner’s Classic burger was a disappointment. Although the chargrilled medium patty had a certain smokiness to it, it’s also very dry. The sweet slices of tomato, sharp red onions and slightly sweet untoasted bun compensate for this incredible dryness to an extent, but it’s still a chore of a burger to eat. It’s like a Burger King burger, but served in a more aspirational environment. Served open so you can take out the toppings you don't like. If you're that fussy. Munching my way through the onion rings wasn’t as fun as it should’ve been either. 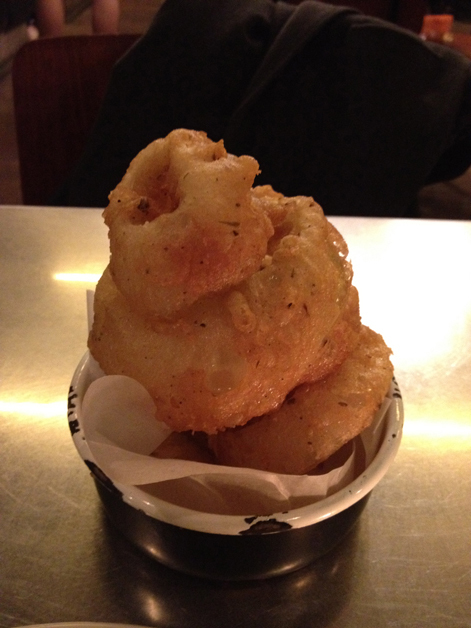 The dry, crunchy layer of thick batter was stodgy and most of the onion slices were just too soft and flavourless. 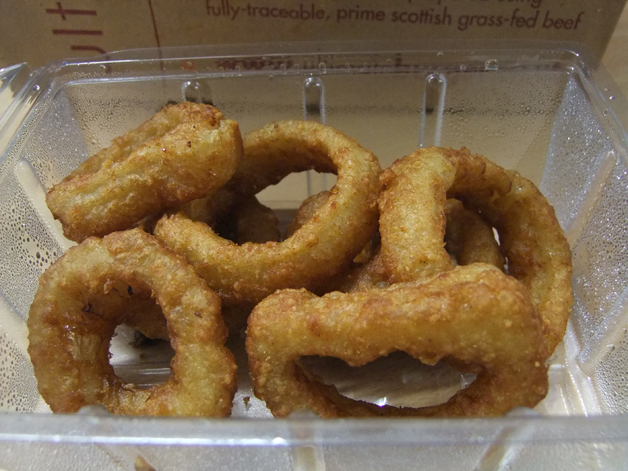 Not all onion rings are created equal. 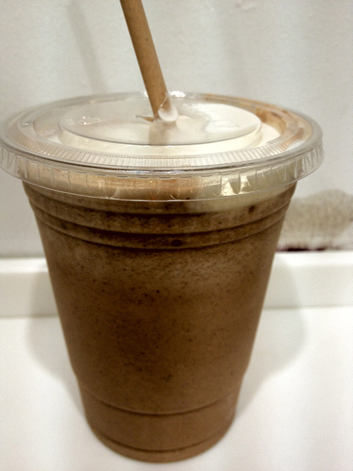 The huge chocolate milkshake is somewhat similar to the version at Fine Burger Co. in terms of its saccharin sweetness, although it’s not quite as sickly nor as thick and viscous. If I ever go back I’m having a flat white instead. Cost for one person: £15 approx. If The Diner is a post-modern reimagining of the American diner, then Ed’s Easy Diner is the classic, unreconstructed, theme park version – bright lit and covered in fake 1950s Americana. The friendly, attentive and efficient service can’t be faulted though. When ordering I had to choose between the Classic, a plain burger topped with nothing more than griddled onions, and the Original which has more embellishment in the form of lettuce, tomato, onion, pickles, mayonnaise and American mustard. I opted for the latter cooked medium and the resulting burger turned out to be quite inoffensive. 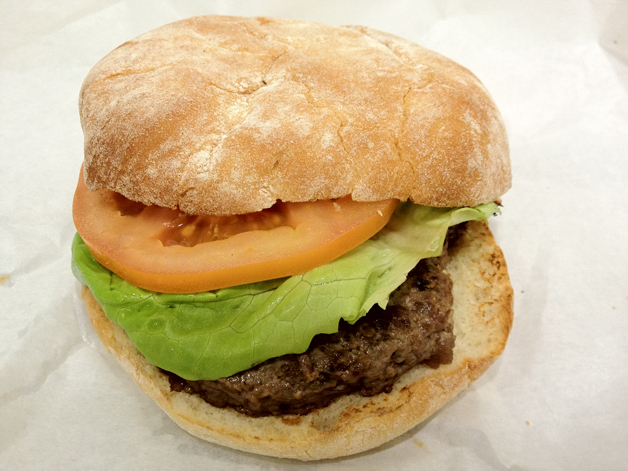 The slightly coarse patty tastes a little sweet, but is also rather dry. It isn’t as bone dry as the meat at The Diner and the Fine Burger Co. and does have some moistness to it, but it can’t hope to rival the succulence of a Hawksmoor or Meatliqour burger. It’s more of a meaty delivery mechanism for the fresh vegetables and creamy condiments, although I wasn’t fond of the overly sweet buns. A competent, if unremarkable attempt. Nothing says class like grease-proof paper. The onion rings had slightly more character and arrived coated in a chewy, soft, slightly doughy batter which was inoffensive but I wasn’t fond of it. The onions weren’t too soft, but were too bland and dry for my taste. Far more successful than either the burger or the onion rings was the chocolate milkshake. The chocolate flavour was more fudge-like with a gentle sweetness and it wasn’t too thick either so slurping it down wasn’t a struggle. That's the oddest shade of chocolate brown I've ever seen. Cost for one person: £12 approx. 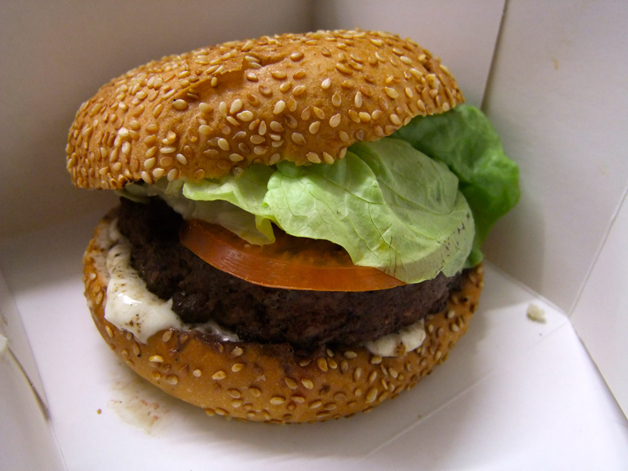 Of all the burger meals reviewed here, the one from Fine Burger Co. is the cheapest. The branch at St. Pancras station also feels the most like a traditional fast food outlet – from the harsh industrial lighting to the backlit menus above the till counter/kitchen area, it all feels quite ominous. Sadly, the Original burger was just as bad as I feared it would be. The well-done patty was dry as a bone and was heavily seasoned with salt, pepper and chopped onion in an attempt to make up for it, but this overseasoning didn’t sit well with me. The sharp red onion and slightly sweet tomatoes were better at adding much need moistness, the patty was fairly coarse and the bun was floury and fluffy. Overall though, an inferior burger. A burger for all seasons? No. No, it isn't. In an unusual twist the onion ring batter was flecked with flakes of chilli and pepper, giving it a noticeable, if modest spiciness. Sadly the batter was also incredibly oily. The quality of the underlying onions varied from sharp and moist to bland and overly soft. Nice try, but must try harder. 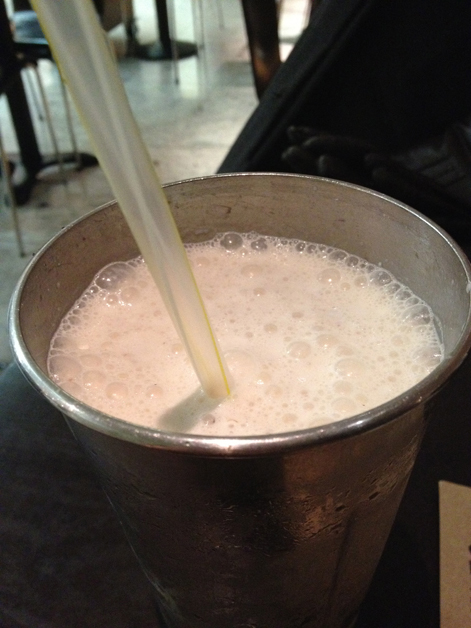 The nastiest part of my meal at Fine Burger Co. had to be the chocolate milkshake. The viscous, congealed liquid was far too sweet for my taste, but the cloying sweetness may appeal to kids. I wouldn’t drink it all too quickly though – not only did it give me brain freeze, it made me feel slightly sick for a minute or two. Cost for one person: £9 approx. I wasn’t expecting much from Gourmet Burger Kitchen (GBK), if only because it has more branches than a teenager has spots. 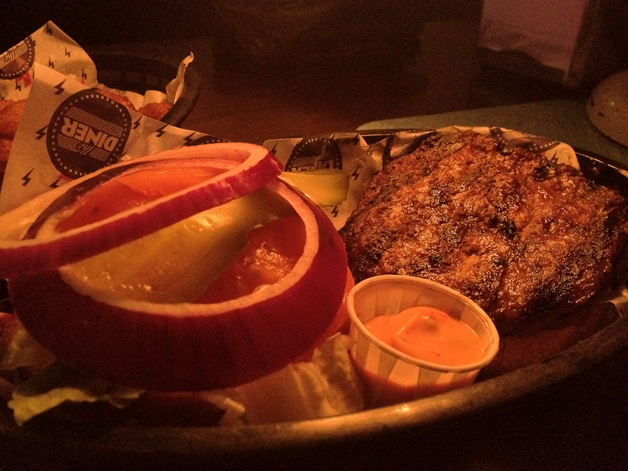 I was therefore pleasantly surprised by the juiciness of the Classic burger cooked medium. 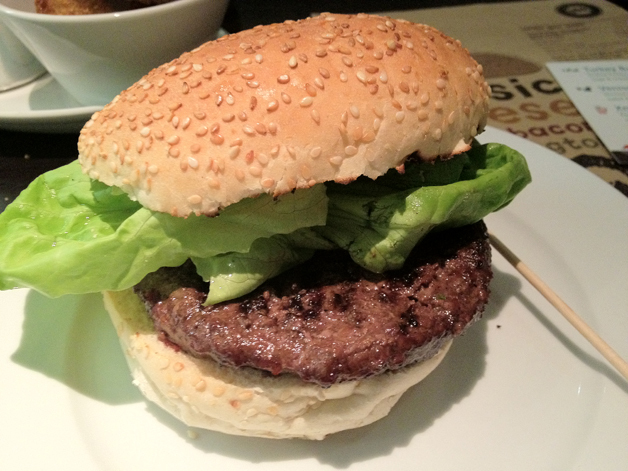 The meaty, moderately coarse patty had a slightly offaly taste to it which I definitely wasn’t expecting. The tomato relish is surprisingly tangy and the untoasted bun holds everything together beautifully well. Surprisingly good. The onion rings on the other hand are an abomination. The bread crumb-style batter is far too oily and crunchy, so working your way through a whole portion is exercise both for your jaw and the hand holding a napkin for wiping your chin. Although there are whole slices of onion underneath all that greasy cardboard, they’re far too soft and flavourless. Awful. 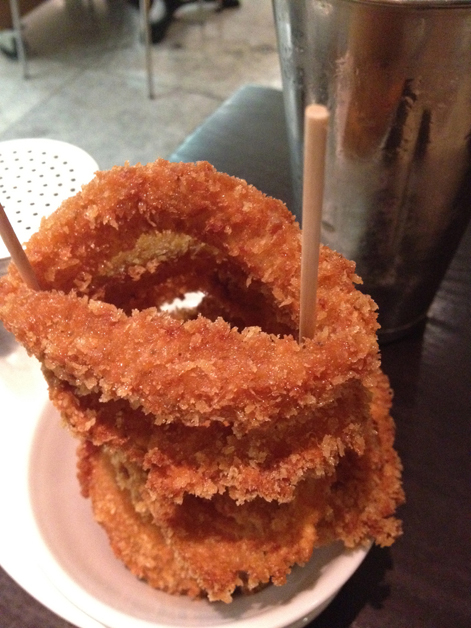 Skewered onion rings. Why? No idea. I somehow persuaded myself to order a mince pie milkshake since I was dining around Yuletide. I was expecting an atrocity in a cup, but I was surprised to find that the thin, slightly watery shake actually did taste of mince pies – fruity and ever so slightly boozy too. There are even some crunchy pastry bits in there too. It won’t be to everyone’s taste, but I liked it despite myself. Me: I’d like a Classic burger, onion rings and a mince pie milkshake please. Idiot behind the till: Would you like some starters, like olives or coleslaw? Idiot behind the till: Are you sure? Me: Uh, yes. Yes, I am. Idiot behind the till: And that was a Diet Coke you wanted? Me: Nope, I’d like a mince pie milkshake please. Idiot behind the till: So that’s a Diet Coke? Me: No, I want a mince pie milkshake. Idiot behind the till: So that’s one Diet Coke. Me: Really no, I just want a Christmas milkshake – like this one here <points to menu>. Idiot behind the till: Ah, okay. One Christmas milkshake. Would you like some starters? Haché is a small chain with only three branches. I dined at the Chelsea branch and was served by a waitress who must’ve had tinnitus as she insisted on SPEAKING VERY, VERY LOUDLY. Even though I was the only customer in the chandeliered dining room. 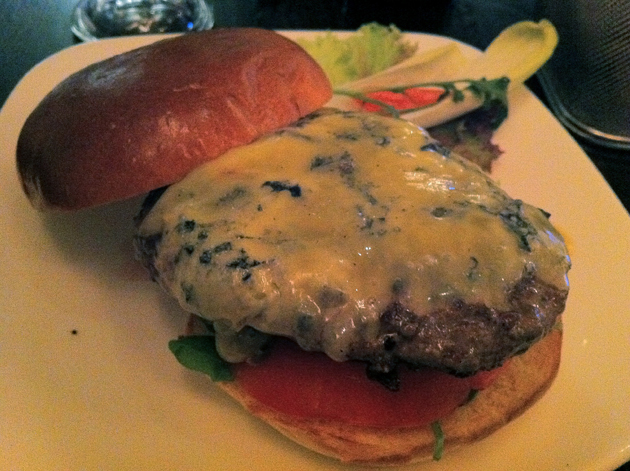 This also made the mistake with my order all the stranger – I ordered the straight ‘steak au naturel’ burger but got one topped with stilton cheese instead. Like I said, strange. The medium rare patty was quite smooth and had a slight pepperiness to it. Although still fairly juicy, it was noticeably drier than the Hawksmoor and Byron burgers. Unimpressively, the melted stilton tasted surprisingly tame for what is usually a strident blue cheese. More worrying was the bun. I opted for the brioche bun over the ciabatta which I find too floury and chewy for my liking, but discovered that the brioche quickly becomes soggy and threatens to collapse in upon itself. 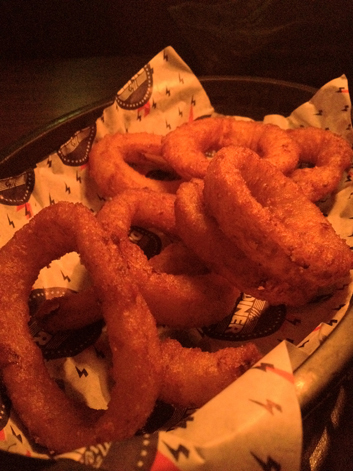 The onion rings were also a mixed bag. Although initially crisp, I quickly discovered that the batter was quite stodgy and chewy. The whole sliced rings of onion underneath were moist and had just the right amount of firmness, but were sadly quite tasteless too. Oh well. 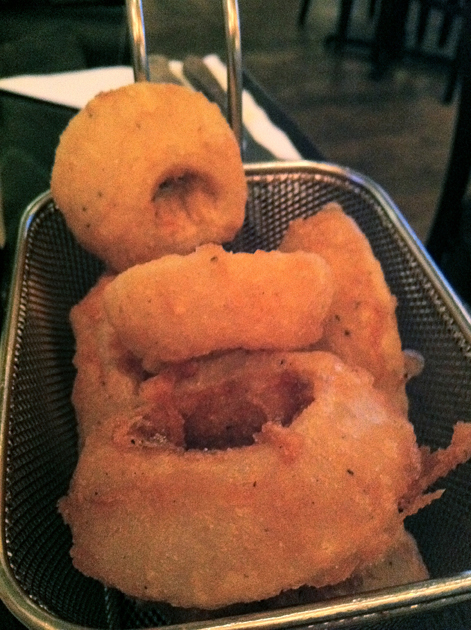 Onion rings presented in a deep fryer wire basket. As if one needed a reminder about how bad they are for one's health. 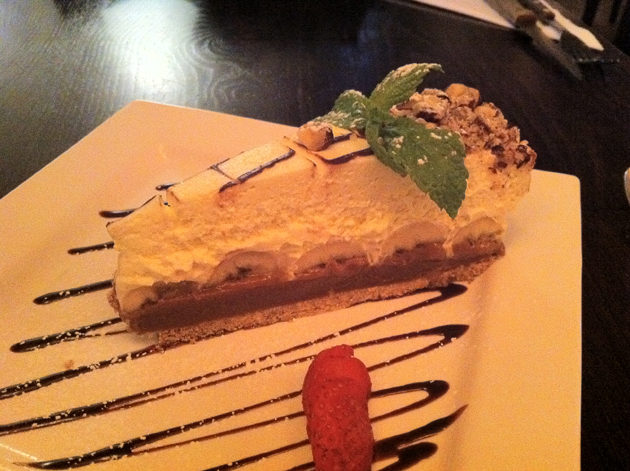 Sadly the chocolate milkshake was off, so I went for a banoffee pie instead. The pastry base had a nice crunchy bite to it, but there was a bit too much whipped cream for my liking. The sliced banana had a nice sweet tang to it and the crushed pistachios were a nice touch, but the actual toffee itself was surprisingly bland. Yeah, I know it's not a milkshake, or indeed any other kind of drink, but what the hell. Cost for one person: £13-20 approx. A name like ‘Ultimate Burger’ isn’t a mission statement – it’s a challenge. Sadly, the take away burger I had from Ultimate Burger isn’t man enough to face up to it. Although the Classic burger is aesthetically pleasing, it’s tasteless in every way, from the fresh-looking but lifeless tomatoes and lettuce to the well-done patty. The beef has a smooth texture, but is incredibly dry and lacking in any character or flavour whatsoever. The only takeaway burger here. Just as bad as the classic burger are the onion rings. The overcooked batter is dry, thick, stodgy and oily. Unsurprisingly, the underlying sliced rings of onion are far too soft and lifeless. Dreadful. 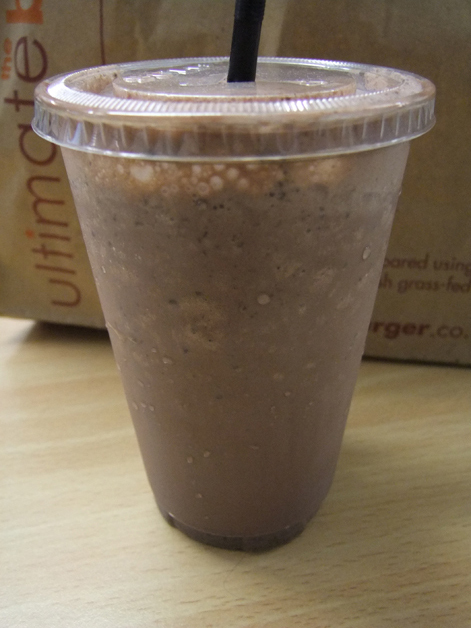 Tastelessness is clearly a trend at Ultimate Burger – even the chocolate milkshake managed it. Although thick and creamy, it didn’t taste of chocolate at all. It was like slurping thickened milk. Cost for one person: £13 approx. My favourite chain burger has to be the consistently succulent, flavoursome burger at Byron, especially when paired with their onion rings. It’s all very reasonably priced and the customer service is pretty good too. Although it’s not very fashionable to favour a chain over an independent, when I can’t get a Hawksmoor burger then I’d rather have a Byron burger over a Meatliqour burger any day of the week. 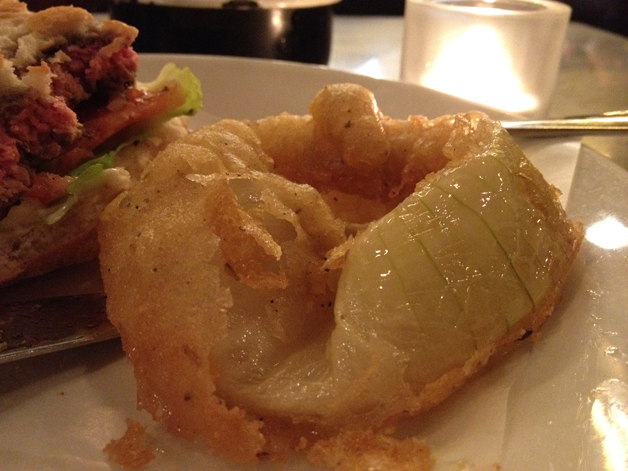 Tags: best and worst, burger, london, milkshake, onion rings, restaurant, review. Bookmark the permalink. Thanks for your insight. I was recently in London and overwhelmed by the buyer choices and crazy queues. We had exactly the meal we needed at Byron.